In its implementation of PBIS, the Pueblo City (Colorado) School District Safe Schools/Healthy Students (SS/HS) Initiative proactively created a system-wide data system to effectively improve its school climate and to reduce suspensions and expulsions. From the beginning, the district PBIS Specialist recognized that the district’s student database did not provide adequate behavioral data for its needs. The PBIS Specialist worked with district data staff to add fields and categories, creating a more comprehensive data collection system to better track students’ behavior. The PBIS Specialist also added an interactive software program, Tableau, to visually map, aggregate, and cross-examine discipline behavioral data with other school data to identify patterns and trends. Using Tableau, the PBIS Specialist can now examine underlying data for any location, day, or student. If there is a blip on the chart, clicking on that blip will help find the underlying causes. For example, if there is a surge in suspended students at a certain time, the underlying data can be examined to determine whether several students were involved in the same incident (e.g., a school fight). This helps the district distinguish between an anomaly and a trend—and, in doing so, to respond accordingly. Staff map the time of day, location on school property, and day of the week when most discipline issues are happening in an individual school or across the district. 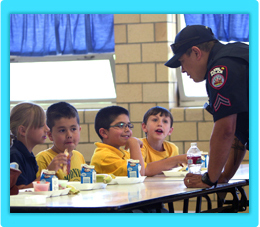 The initiative can then, for example, share data with the School Resource Officers (SROs) at roll call to distribute SROs to the “hot spots” of the school at the appropriate times of day. Data are shared with school principals in PBIS teams and leadership teams. In one school, staff responded to the data showing an increase in problem behaviors in the lunchroom by changing the number of lunch periods offered, thereby reducing the number of students in the lunchroom at the same time. As a result, discipline referrals decreased dramatically. The data system allows the district to identify how students who participate in Exceptional Student Services (i.e., assistance with emotional, intellectual, academic, or physical needs) or who are members of different racial populations are affected by disciplinary practices, in order to determine any disparities in enforcement. So far the district has found no significant disparities among student groups, although it has noted differences between schools. District staff actively track data across programs and services to capture trends over several years and to identify the collective impact. They then use these data to make decisions on where to allocate resources within the tiered intervention pyramid. By creating a holistic tool that assesses trends and issues across the school district, Pueblo City’s SS/HS Initiative is empowered to not only respond to challenges, but also proactively improve the school environment.